Banger wants to save the day. Mik wants to save the world. What they really need is to save each other. When Banger wakes up in an earthship house in the desert, surrounded by dragons, he knows his whole life has changed. Add to that the fact that the man he’s been chasing for years has a new lover, and he’s pretty sure his day can’t get much weirder. Which is when he accidentally trips trying to save his friends and shoots someone. Mik has never been shot on a first date before. When his spirit dragon Piasa tells him to go to the little compound in the Chihuahua desert he’s expecting dragons, maybe smugglers, but he figures no one could expect Banger. 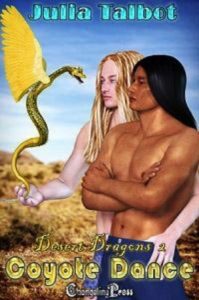 Even as Mik falls for Banger, his new lover decides he’s a danger to the baby dragons he’s there to help, and Banger ends up kidnapped by a white slaver in the desert. Can Mik save Banger from danger, and keep him from hurting himself? Publisher’s Note: Coyote Dance is best enjoyed after reading Turquoise Trail (Desert Dragons 1).